The Rio Tinto mining corporation is a British/Australian transnational mining corporation that is the second largest mining company in the world. It is a close second – in terms of ranking in the Forbes 500 – to the biggest, the British/Australian mining corporation BHP Billiton (considered the 19th worst polluting corporation in the world). 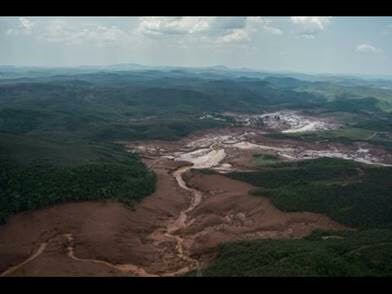 BHP Billiton was responsible for Brazil’s largest environmental disaster in history when, on November 5, 2015, two of the dams encompassing its toxic tailings ponds burst, suddenly releasing uncounted millions of tons of poisonous slurry into the Rio Doce river, killing all aquatic life downstream and wounding many local people. The huge amount of poisons suddenly released have likely permanently polluted the waters of the once drinkable and fishable 300 mile long river all the way to the Atlantic Ocean). Incidentally, BHP Billiton is one of the 90 largest corporations in the world that extract and market fossil fuels and are responsible for 2/3 of the greenhouse gas emissions that have been altering the earth’s climate and polluting its air, water, soil and animal and plant life since the beginning of the industrial age. After Rio Tinto purchased the mining rights to large portions of copper-rich southwest Spain in the late 1800s, the English mining corporation named itself after the river that flows out of the area, which contained one of the largest pyrite (pyrite = “fools’ gold” = iron disulfide [FeS2]) sulfide deposits in the world. The area that was damned to become Spain’s most polluted area is called the Iberian Pyrite Belt (IPB). Over the centuries, the IPB attracted a number of exploitative corporate entities, including the Roman Empire, because of the raw copper and high grade copper ore, as well as the occasional silver and gold deposits (from which the Romans cast some their earliest coins). Incidentally, Tinto in Spanish means “tainted” (not “red”) after the highly contaminated (with toxic minerals and sulfuric acid) and multicolored (usually red from dissolved iron oxide) hues that discolored the toxic water emanating from the underground and open pit copper/iron/manganese sulfide mines that had been active off and on for thousands of years. The Rio Tinto watershed and estuary was once, before Christopher Columbus set sail from the river in 1492 and for several centuries prior to the era of open pit sulfide mining, a thriving commercial fishing area, but ever since the mining corporations began exploiting the area (with open pit mining techniques), the estuary fed by the Rio Tinto no longer has any fish or other aquatic life in it. And offshore, in the Gulf of Cadiz, the only commercially viable fishing today is for small migratory fish like sardines and anchovies. Water Downstream From Rio Tinto Copper Mine Has a pH of 2! 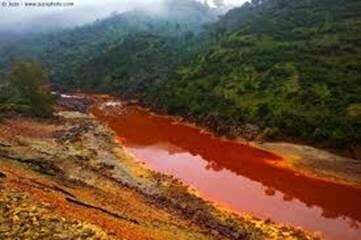 The Rio Tinto, despite attempts at governmental remediation over the past generation, people still can’t drink the water, only partly because the water in the river has a dramatic acidic pH of less than 2, which approximates the acidity of stomach acid. Chemical burns are guaranteed if human skin or mucosa is exposed to the water even for a brief time. The river water is infamous for being able to dissolve iron. But acid water isn’t the only reason that the water can’t be used, for the Rio Tinto is also one of the most chemically polluted watershed systems in the entire world. But it wasn’t always that way. One can thank the inherent dangers of sulfide mining for its demise. Poisoned watersheds, including both surface water and aquifers near either underground or open pit mining, are inevitable and are also likely to be totally irremediable forever, no matter what is said in the carefully scripted corporate talking points that seem to be so convincing to naïve politicians and bureaucrats. Copper/sulfide mine-contaminated Super Fund sites that occur near lakes, streams and aquifers can never be remediated no matter how many billions of scarce tax dollars are thrown at them or how many millions of dollars are theoretically set aside for the inevitable future catastrophic tailings pond ruptures. The few temporary jobs “promised” by the sociopathic corporations will not be given to the vast majority of northern Minnesota miners. There are less risky ways to create jobs.